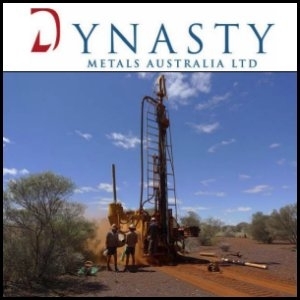 Perth, Sep 17, 2012 AEST (ABN Newswire) - Dynasty Metals Australia Limited ( ASX:DMA) confirms that a planned 220 line kilometre ground magnetic survey has commenced on Dynasty's E52/2591 tenement in the Newman area. This tenement is covered by recent alluvials and has been ignored by previous explorers despite having significant Marra Mamba hosted mineralisation in outcropping areas adjacent to the tenement. Regional magnetics show significant anomalous areas that may reflect shallow Hamersley basin sediments below the cover. The entire tenement will be covered on 100 metre spacing with the areas considered most prospective to be infilled to 50 metres. Processing of the ground magnetic data will allow siting of drillholes for a reconnaissance drilling program later this year.